Birds, reptiles, ferrets, rabbits, chinchillas and other small mammals (like guinea pigs, sugar gliders, hamsters, gerbils, rats and mice) are all welcome at the Montgomery Animal Hospital. Dr. Krumanaker is passionate about exotics and has additional training in their unique and complicated needs. 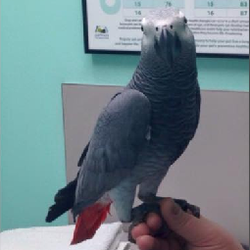 Avian Medicine: Your feathered friends are in good hands whether they need basic grooming (beak, wing and nail trims), wellness care, advanced diagnostics or a behavior consultation. Dentistry: Rabbits and rodents have teeth that grow continuously throughout their lifetime. This can quickly lead to problems if they wear unevenly. Dr. K has the specialized tools to assess and treat your pet's mouth. Preventative care: Our exotic pets hide illness extremely well. We recommend every pet be seen at least once a year for a full physical exam, lab tests as necessary and a nutrition and husbandry consult. Let us help you provide the best care for your exotic pets.